At $3,000 for the Development Edition, Microsoft's HoloLens headset is expensive, even compared to the Oculus Rift ($599) and HTC Vive ($799). It's also not as far along as the Rift or Vive in terms of commercial availability and applications. Nevertheless, Microsoft sees a bright future for its AR headset and is committed to making sure all future Windows 10 PCs support mixed reality content. Microsoft's Windows boss Terry Myerson made that clear during Intel's annual developer's conference in which he announced a partnership with the Santa Clara chip maker. "All Windows 10 PCs next year will include a holographic shell," Myserson said, according to The Verge. He added that all PCs running Windows 10 will work with a head-mounted display and support all Windows holographic applications. The support Myerson is talking about will come by way of a Windows update, which will enable mainstream PCs to run the Windows Holographic shell and associated mixed reality and universal Windows applications. Microsoft says it will enable an entirely new experience for multi-tasking in mixed reality, one that blends 2D and 3D apps at the same time while supporting a range of devices. When Microsoft talks of this working on mainstream PCs, it means that even those tiny Intel NUC machines will support the experience. Here's a video of Windows 10 Holographic shell running on a NUC at 90 frames per second. "Intel and Microsoft are collaborating on a specification for mixed reality ready PCs and HMDs. Our shared goal is to enable our hardware partners to build a broad range of devices for the mainstream consumer and business markets. We are working with several partners on the spec today, and plan to publicly release v1 of the spec at the Windows Hardware Engineering Community (WinHEC) conference in Shenzhen in December," Microsoft said in a blog post. Microsoft's push to support HoloLens on all Windows 10 PCs seems focused on productivity at the moment, though it also paves the way for gaming, at least when the price of the headset comes way down. 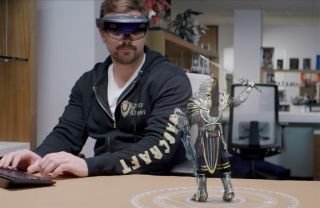 To that end, Microsoft earlier this month called to attention what Legendary was doing in the entertainment space with HoloLens and how it enables fans to get closer and interact with characters in new ways. It seems like a lot of hype the moment, but with Microsoft making a push to support HoloLens on mainstream PCs, things could start to fall into place rather quickly beginning next year.